We all have things that we want to achieve in lives. We were told to set goals, to be ambitious, and to have big and bold dreams to pursue. But do you know that this thinking may not be helpful if you delay or peg your happiness to it? It is great to have goals you want to achieve in the future. And there is absolutely nothing wrong with that. However, this type of thinking is dysfunction only when you peg your happiness and success to it. For example, you set a goal to earn X amount of money in the future. And you keep telling yourself that you will only feel like a ‘success’ when you hit your goal. When this happens, you postponed your happiness and your confidence. You don’t feel as successful right now until you achieve your goal. You set a condition for you to feel happy. And this is the thing that caused most people to feel inferior when they fail to achieve their goals. This is why so many entrepreneurs lose their flow. They delay their happiness and their sense of achievement. I’m going to celebrate when I hit my goal. I’m going to throw up a party when I achieve my target. I’ll be successful when this or that happens. This is the FUTURE GAP of where you are now and where you want to be. And this gap is what causes so much stress, misery, and distress among so many people. They postponed and delayed their happiness until they achieve their goals. They don’t feel great because they’re not there yet. First, you delay your happiness because you’re not where you want to be, yet. Second, even if you have achieved the result you want, guess what will happen next? When you achieve your goal, you’re going to set another higher goal. And again, you delay and postpone your happiness to a later time. So stop thinking this way. Stop focusing on the future gap. When you focus on the future gap, you condition yourself to delay your happiness. You stop feeling the “success” until you achieve a certain goal. 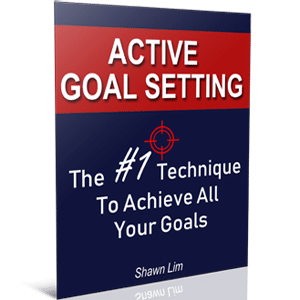 While there is nothing wrong with setting a goal, this future gap thinking is not going to help at all. So instead of focusing on the future gap thinking, change the way you think – focus on the reverse gap thinking. I learned this concept from the founder of MindValley, Vishen Lakhiani. The reverse gap thinking was first made popular by Dan Sullivan, the famous management consultant. Thus, instead of focusing on the future, choose to think about your past. Choose to think about how far you have come since day one. Think about how far you have come, and then feel grateful for it. It may sound simple, but the effect is enormous. When people appreciate and feel grateful for what they have, they get an instant mood boost. They become happier, more inspired, and healthier. This is what the reverse gap thinking is all about. You look at how far you have come and then appreciate all the experiences and the things that you have gone through. You don’t have to delay your happiness like what happens in the future gap thinking. You just need to count your blessings. And this is also how you can encourage yourself to achieve more in life. Dr. Robert A. Emmmons of the University of California with several others once conducted a study and they asked all participants to write a few sentences each week, focusing on particular topics. One group was told to write about things they were grateful for that had occurred during the week. After 10 weeks, those who wrote about gratitude were more optimistic and felt better about their lives. You can read the more detailed article of the study here. In other words, to feel great and to encourage yourself to be more successful, you don’t have to wait until you reach your goals, you just need to spend a few minutes each day writing down things that you are grateful for. So every morning, before you go to work, sit down on your favorite chair and write down a couple of things that happened this week that made you felt grateful. Stop delaying or postponing your happiness and success. You can feel happy and successful right now at this instant. You don’t have to wait until when you achieve your goals only to feel happy and successful. 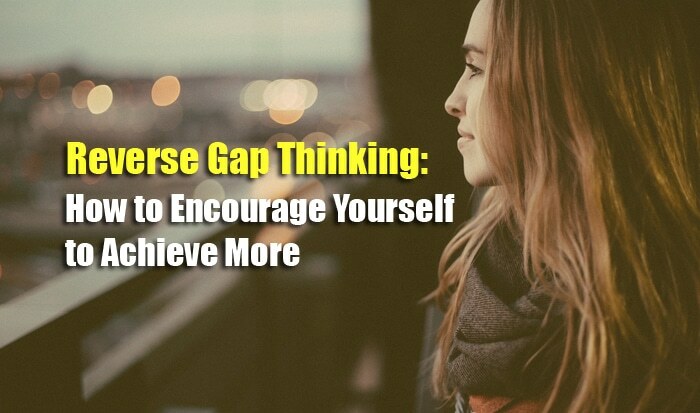 You can do it right now by practicing the reverse gap thinking. And to do so, you just need to appreciate what you have done and be grateful with how far you have come. So every day, spend a few minutes to write down on all the things that you are grateful for. Reflect on what has happened yesterday and find the positive things to focus on. Feel great right now. This is how you can encourage yourself to achieve more, to be happier, and to live a better, and more successful life.